Angel Zakuro (eCard Portfolio) fight. Edit: Ok...now that theO is working again, I can edit this lol. Um, so I took the scan, and at first I was going to go with all the warm colors going on. Buuuut it was TOO much color. So then I went the total opposite. XD All black and white lol. Sharpened it and worked with the contrast and such...made it really high. Then I did A BUNCH of things in dealing with the text...and all of them failed horribly. I tried different brushes, making the typography small...just bleh. I didn't like it lol! 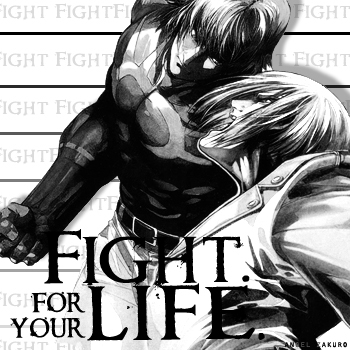 So I went all out and extracted Iori and Orochi and made my own bg with just the word "fight" repeated over and over with some lines. XDD It took a loong time to do all this...but I finally like how it ended up. :) Glad you guys do, too! !